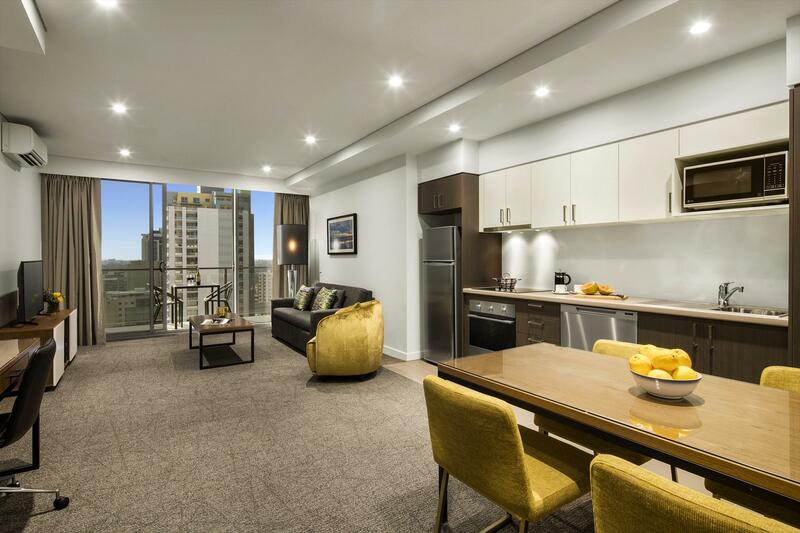 The spacious private balcony in this Two Bedroom Executive Apartment is ideal to relax and enjoy Perth�s outdoors. The apartment accommodates up to four guests in two King sized beds (option to split into four singles) and additional bedding is not available. Apartments feature a full kitchenette with stovetop, microwave, full size fridge/freezer and dishwashing facilities. A separate living/dining area, two separate en-suites with shower. 42 Inch LED TV with Foxtel and DVD Player (31 Inch LED TV in bedroom), high-speed internet access, with complimentary 400mb of data usage daily work desk and washer/dryer. 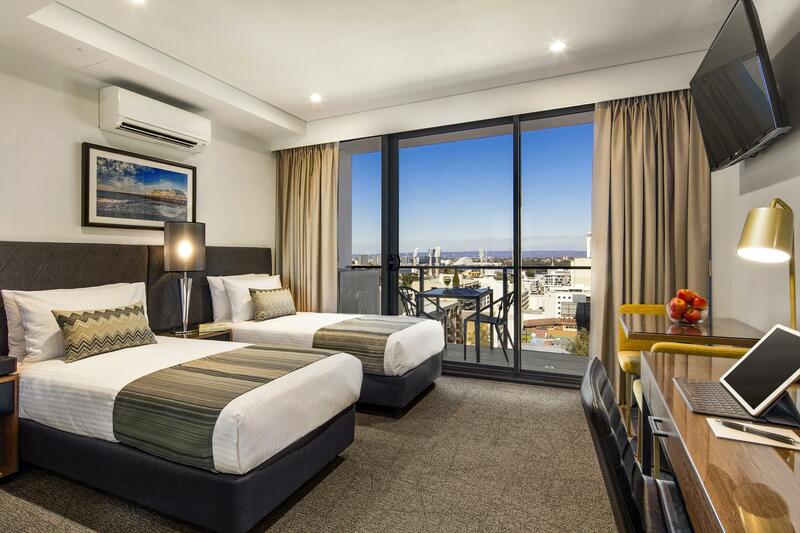 Besides the in house Gym, guests staying at Quest East Perth receive complimentary access to Hot Yoga Fireshaper and F45 Health Fitness, both within walking distance. Rates include daily housekeeping service, excluding Sunday & Public Holidays. Breakfast and restaurant dining options are available. The One Bedroom Executive Apartment will give you space to relax and a private balcony to entertain. Accommodating up to two guests in a King sized bed (option to split into two singles), additional bedding is not available. Full kitchenette with stovetop, microwave, full size fridge/freezer and dishwashing facilities and a separate living/dining area, en-suite with shower with an abundance of natural light from the floor to ceiling window�s. 42 Inch LED TV with Foxtel and DVD Player (31 Inch LED TV in bedroom), high-speed internet access, with complimentary 400mb of daily data usage, work desk & washer/dryer. 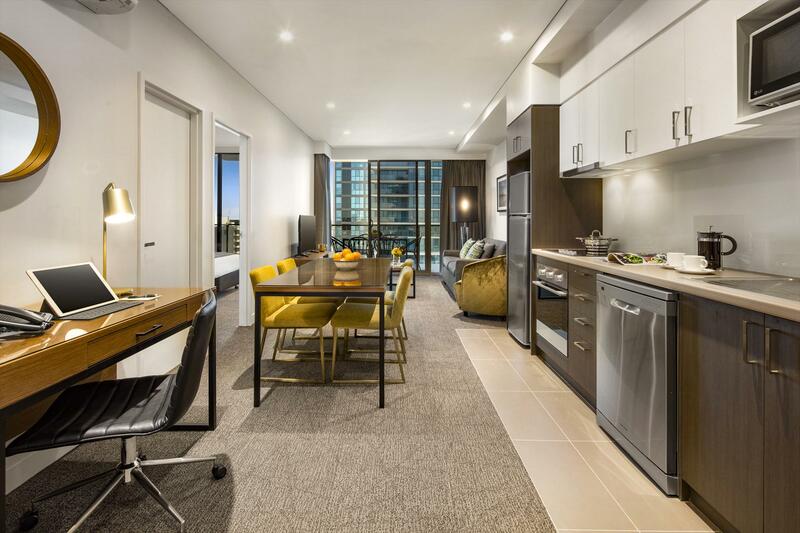 Besides the in house Gym, guests staying at Quest East Perth receive complimentary access to Hot Yoga Fireshaper and F45 Health Fitness, both within walking distance. Rates include daily housekeeping service, excluding Sunday & Public Holidays. Breakfast and restaurant dining options are available. Modern open plan Studio Apartments are stylish and an ideal alternative to a standard hotel room. The Studio Apartment offers Foxtel, LCD TV and work desk with access to high speed Wi-Fi, with complimentary 400mb of data daily usage. A King sized bed with kitchenette and stovetop, microwave, bar fridge and en suite with shower. Besides the in house Gym, guests will enjoy complimentary access to Hot Yoga Fireshaper Studio and F45 Health Fitness, both within walking distance. Rates include daily housekeeping service, excluding Sunday & Public Holidays and free use of the self-service guest laundry facilities. Breakfast and restaurant dining options are available. The oversized or with a balcony Studio Executive Apartments are both inviting and welcoming. Both accommodation options are spacious and stylish. This Studio Executive are open plan and offer kitchenette facilities, stovetop, microwave, bar fridge and en-suite with shower, Foxtel, LCD TV and work desk with access to high speed Wi-Fi, with complimentary 400mb of daily data usage and a King sized bed. Besides the in house Gym, guests will enjoy complimentary access to Hot Yoga Fireshaper and F45 Health Fitness, both within walking distance. Rates include daily housekeeping service, excluding Sunday & Public Holidays and free use of the self-service guest laundry facilities. Breakfast and restaurant dining options are available.